AnniesCostumes.com: Welcome to our blog & our world of costumes! Thanksgiving Day Costumes give a new meaning to "Turkey Dressing"! Thanksgiving costumes: turkey costumes, pilgrim costumes, Native American Indian Costumes all in child and adult sizes. Congrats to our President on another 4 years. Once again, the presidential candidate mask sales accurately predicted the winner of the presidential race. Barack Obama masks outsold Mitt Romney masks, not just in our business, but for the industry. 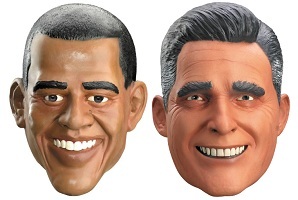 Since the 1980 election, the top selling presidential candidate mask was also the winner of the presidential campaign.